A blowout preventer (BOP) controls the underground pressure of an oil or gas well and prevents the uncontrolled release of oil and/or gas. Since s failure in a BOP can have catastrophic effects for the crew, its performance and reliability are of critical importance. 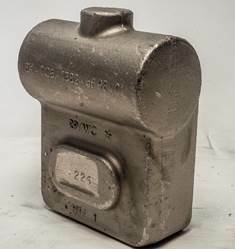 A hinge bracket is an important low-pressure blowout preventer’s component. Its main function is to keep the door of the BOP in a sturdy position and allows it to open only when the rams are moving. The hinge bracket controls the rams by a hydraulic circuit that guarantees the performance of the operating piston during the use of the BOP. Setforge supplies the oil and gas industry with high-quality hinge brackets, made to resist all mechanical and hydraulic stresses in order to ensure the safe operation of the blowout preventer. Farinia Group is a leading manufacturer of highly dependable parts for a wide range of industries. All our components meet the stringent requirements of all international standards.